Good start to power sharing as PKR, DAP, PAS discuss win-win solutions. "He told me, a mad gleam in his eye, that we were going to get there. And this time, I had no doubt that we would." This was to have been my last piece for Singapore's mypaper, the daily I've been writing for throughout the two weeks or so of the PRU12 period. It was published yesterday. The Star has a different take on its front page today, Parties find themselves in a quandary trying to form governments. I was in the republic for a day trip yesterday. Drove a fellow blogger there for his job interview but he's no longer that enthusiastic about the prospect of working there as he was before the election. It's a brand new era in Malaysia, he said. "There doesn't seem to be a good reason any more to leave and work elsewhere." After his interview, we had tea with an editor from the mypaper. I've agreed to write a weekly column for them on Malaysia, starting soon. Will let you know. So you, too, being wooed by the Singapore establishment? I'm slightly bemused, considering how you've ranted on about Singapore elements in the Pak Lah administration. Just be wary of the red dot, even though you were born there. I don't trust them. OMG! the singgies bought ROCKY! Lim Guan Eng of Penang selects an Indian and Malay as his deputy chief ministers. That's the Malaysian spirit. I thought the same with Attila too.Whats with Mypaper?. Are they independent? Or another PAP mouthpiece like Straits Times.Can there be independent press in Singapore? Another blogger, I believe, who made a hugh impact on raising political awareness among younger generation is none other then Mr. Kenny Sia (kennysia.com). He might not be a political blogger but his writings manage to reach readers who otherwise will never visit any political blog. Congratulations Rocky..on the "official" status granted by NUS for the interview..ie. being one of the bloggers effectively influencing our nation's political history! Malik, Haris, Jeff, Elizabeth - all deserve it too. Looking forward to your column here in Singapore, good luck! Selling out too Rocky? What a shame. But of course, you have a thing or two to teach the Singaporeans so that's ok.
expect more negative news about the new state government from now till the next election. think haris should seize the momentum and give FPT a big push. 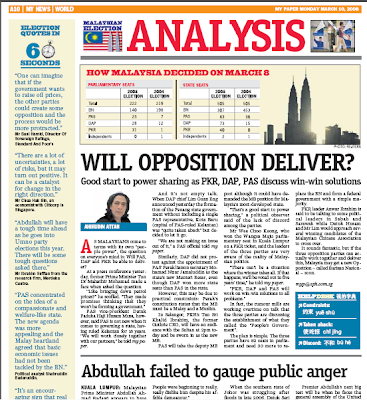 "Anwar plotting opposition's next move"
Go to the link to "Free Stories" to read these reports. Hey Rocky, if the MSM, and the country that you love cannot or afraid to give you a column or offer you a job, well take what you can, you have a family to look after! Don't worry, there aren't two of me. I went to Spore yesterday, set off about 8 am, friend's the interview at 2, had tea with mypaper about 5, and reached the Press Club about 10.30pm, just before the kitchen closed (at 11pm). The "Please Go" protest was on Monday, 9 am. Couldn't make it because I was only told about it about 11.30pm the night before and I had plans with the kids. The next thing you know is that you will be invited to the Istana in Singapore for a chat with the MM. He will want to find out your take on developments in Malaysia. An invitation for a chat with the Spore MM is like the Good Housekeeping Seal of Approval! hey! your blog is really cool! can we exchange links?